For more than 30 years, APV Germany has been producing masking paper rolls for a wide variety of applications, offering you a well-rounded portfolio, from low-cost standard paper to high-quality premium products. In addition, various floor cover papers for industrial and commercial use as well as unwinding devices are available. With the use of APV cover papers, you rely on the environmentally friendly raw material wood for an environmentally friendly product. We see ourselves both as partners for industrial as well as handicraft oriented companies. We offer a technical service, which will assist you with words and deeds, also on site. 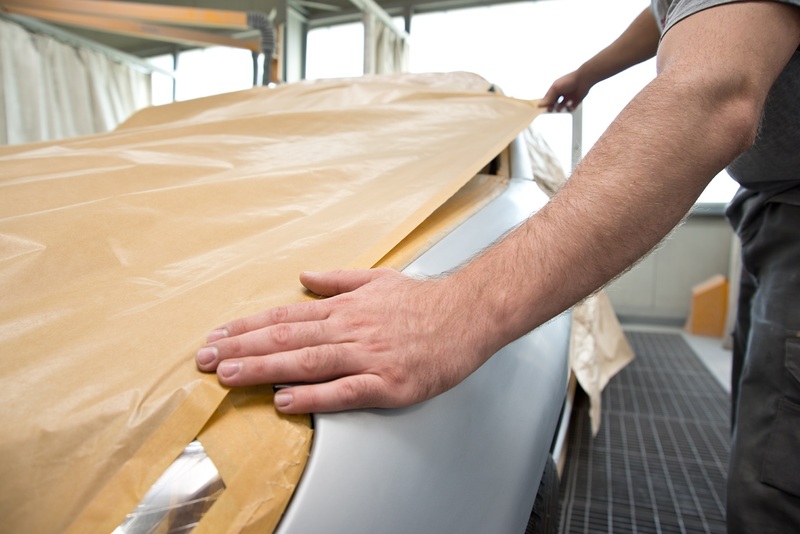 In a body shop masking paper is needed to cover body surfaces and discs, so that only the intended areas are painted. It must have certain qualitative requirements: It should be sufficiently dense and puncture resistant, adapt by a supple consistency to the body shapes and have increased wet strength to persist with commercial base, acrylic and clear lacquers. The sufficient density receives our masking paper by the raw materials used and refining processes in papermaking. The better these raw materials are, the thinner the paper may be with consistent or even better properties. As one of the leading German manufacturers of high-quality lacquer-coated paper rolls, APV Germany GmbH has been supplying higher-quality cover papers throughout Europe for more than 30 years, which have been constantly further developed and refined over time. Thus, an adaptation to the modern painting technology is always guaranteed. In industrial and commercial areas, there are many requirements to protect substrates, floors, products or materials. Be it dust, falling dirt particles or liquids such as paints or oils. Depending on the specific application, budget and the desired resistance to liquids, we offer two different varieties to choose from. On the one hand the ecological and cost-effective EASY and the strong and absolutely dense ADVANCE. Mobile or wall mounted paper trolleys for up to three rolls of masking paper (or other secare reel types) with a maximum width of 1200 mm and with a holder for adhesive tape rolls.